I am not a good baker…but I can make pie. Some may be intimidated by pie. Some may laugh at the simplicity of it. I don’t believe pie is difficult, but it is also not that easy. It’s really only made of two or three parts- crust, filling, and possibly a topping- but you have to master those things to make a perfect pie. My dad and Auntie Pam make the best pies you’ll ever taste in your life. Hands down. No arguing. They learned from their parents and the generations before, and here I am trying to fill their shoes and continue the legacy. Okay…I’m not sure if he actually hung up on me, but for my dad to get that serious about something, you know it’s worthy of hanging the phone up on me, and in this case that something was PIE. This pie I have to share with you isn’t simply apple pie, but it can be if you want it to be- just add more apples and exclude the cranberries. That’s sort of the point of this recipe and pie making tutorial- to give you the essential tips of pie making so you can make a million variations of pie knowing the basic rules. 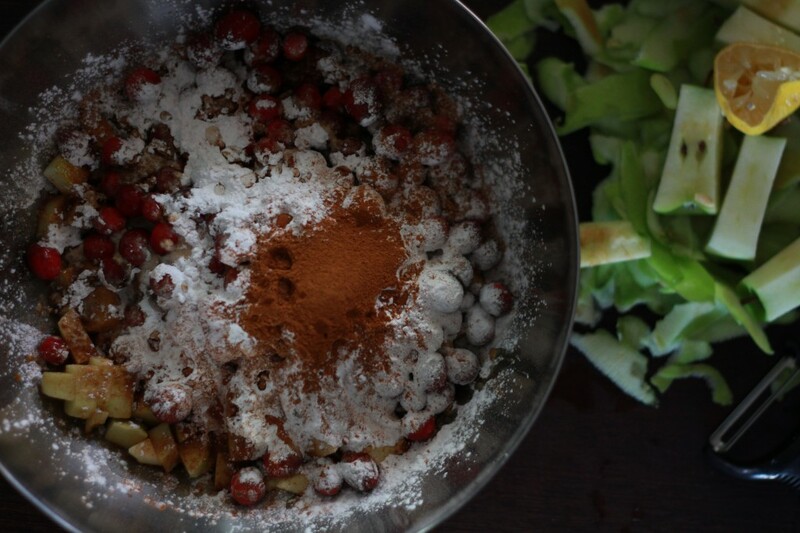 I like the cranberries in mine because I like the tart, sour berries that pop in your mouth alongside the gooey apples, and I always like to add twists to traditional holiday recipes. For all my tips on making the perfect pie crust, you’ll have to head over to my Perfect Pie Crust post. 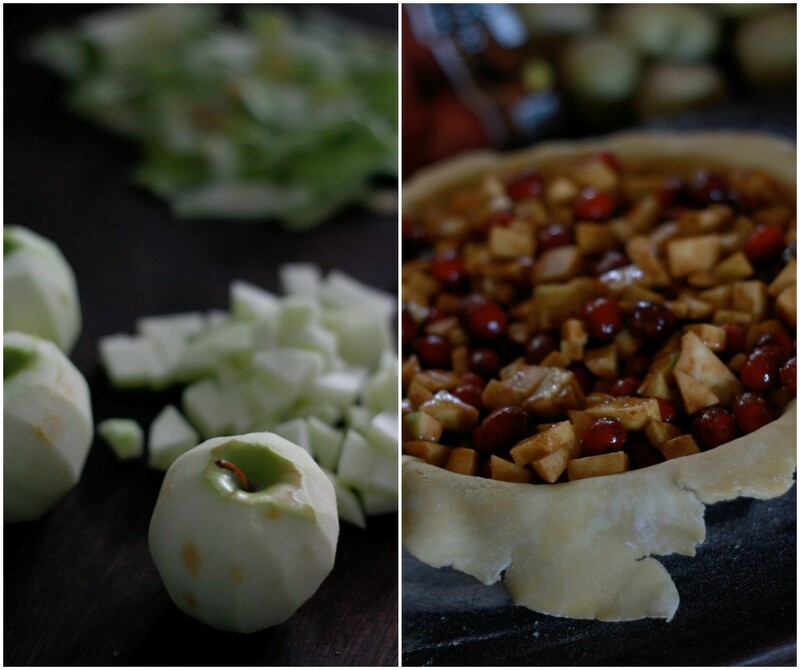 Feature the star ingredients of your pie filling- don’t smother them with too many added ingredients. If you’re going to make a pie filling from scratch, make sure it tastes like it’s from scratch and not from a can. Start with top quality ingredients and make them stand out. The sugar, flour, vanilla, spices, or whatever you choose to pair with your filling should only be there to enhance the flavor and texture of the main ingredient- not mask it. The possibilities are truly endless, but again- don’t go crazy. Stick with one or two feature flavors and make it all about them! 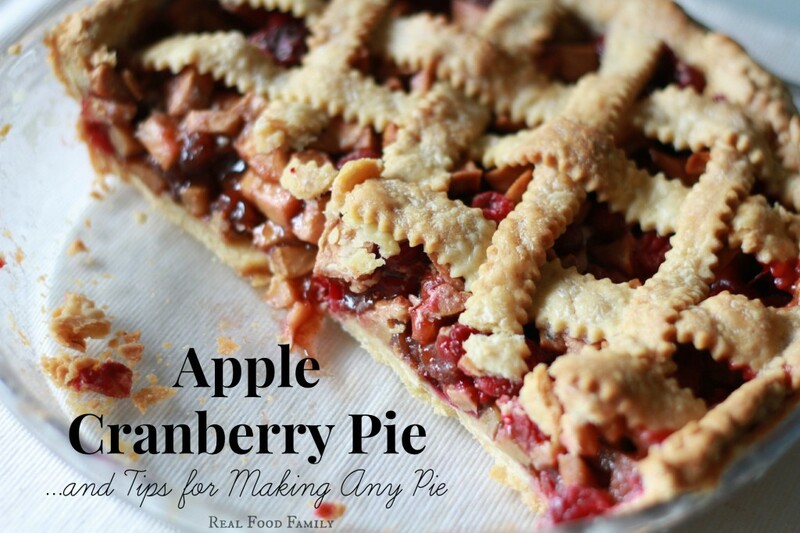 The key to a perfect pie filling is mastering the balance of the main ingredients (typically fruit) with the coating of added ingredients like flour, sugar, spices and flavorings. (This tip is for basic fruit pie fillings, not specialty pies like lemon meringue, pumpkin, chocolate, etc..) While measurements in a recipe are helpful, it’s best to learn how to eyeball the amounts of ingredients to add. First fill a large mixing bowl with the cut up main ingredients. In this recipe it is about 80% apples, 20% cranberries. Next add a small amount of liquid (like lemon juice, apple cider/juice and vanilla in this recipe) to help adhere the dry ingredients. If you are using a wet main ingredient, like berries, limit the amount of liquids that you add. Next you are going to add enough sugar and flour (or arrowroot powder in most of my recipes*) to give the filling an even coat. *I use arrowroot powder instead of flour, or at least a mixture of both, to ensure a gooey filling and to eliminate the amount of refined flour in my pie. Arrowroot works just like cornstarch in pie, but be careful because too much of this can turn your filling into a gelatin…not so good. Arrowroot is a perfect option for any filling if you are making a grain-free pie. With the popularity of “Paleo” diets, nut-based crust recipes are plentiful online, but you can’t really use a grain-free flour or nut product to get that gooey filling result. Arrowroot is grain-free and works perfectly! Make sure to buy arrowroot in bulk bags from health food stores. The tiny little spice jar versions in supermarkets will be WAY too expensive! 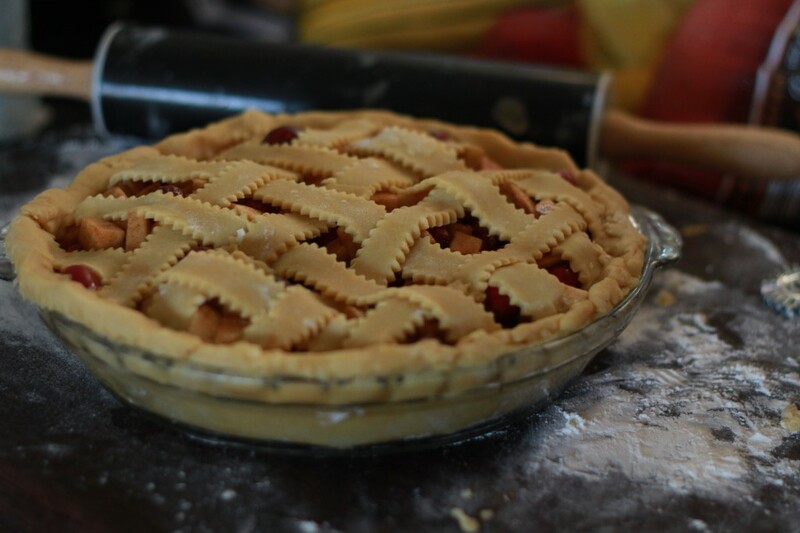 Pie toppings include crumbles or streusels, meringues, creams, or a layer or lattice of extra pie crust. For a crumble or streusel, you basically mix together even amounts of butter and flour with enough sugar and spices (like cinnamon) to flavor it. When it turns into moist crumbs, evenly sprinkle it over the top of your pie. For other pie toppings a recipe is usually best because it’s meant for that specific pie, and pie toppings can be finicky. I hope those tips help you out a little. Again, make sure to head over to my Perfect Pie Crust post because I have more crust-related tips there. Take 1/3 of the pie crust dough and set aside. With the remaining majority of the dough, roll into a 14-inch disk that is 1/4-inch thick on a lightly floured surface. Transfer disk to a deep 12-inch pie pan. (Make sure you aren’t using a shallow tart pan.) Press the dough into the sides and over the top edges of the pan and slice excess dough from under the outside lip of the pan. Place the apples and cranberries in a large mixing bowl and toss with the apple juice or cider, lemon juice and vanilla extract. Add sugar, arrowroot powder, cinnamon and salt and toss all the ingredients to evenly coat the fruit with the dry ingredients. Pour the filling into the prepared pie pan. Don’t overfill the pan. Use excess filling for another use. Roll the pie dough that was set aside into a large disk that is a little less than 1/4-inch thick on a lightly floured surface. 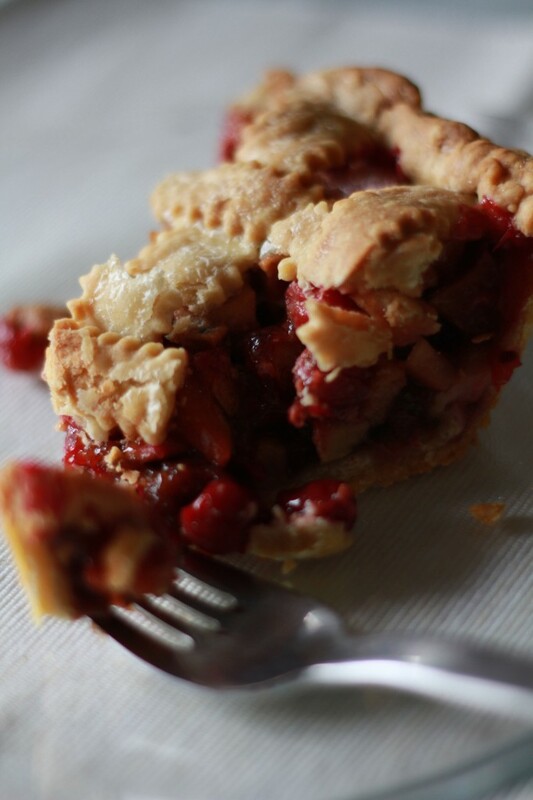 You can either top your pie with a full layer of this crust, or make a lattice crust topping. For a full layer crust, simply transfer the disk of dough over the filled pie pan, pinch the sides of the crust together (roll the bottom crust over the top so filling doesn’t spill out and into your oven), stab the top with a sharp knife to create 5-6 little vent holes, then sprinkle with cinnamon and sugar. For a lattice crust, slice the disk into 1/2-inch strips. Weave the strips over the pie, pinching the dough on the sides together, then sprinkle with cinnamon and sugar. Bake the pie for 45 minutes, then remove the pie from the oven and brush with heavy cream. Return to the oven and bake for another 15-25 minutes, until crust is golden and shiny and the filling is soft and gooey. Let the pie cool completely, or at least until it is lukewarm, before serving. Enjoy your pie immediately, or make it your breakfast for a week like we do!